Hellooo Handsome! The new Chicago Cubs president of baseball operations has made his way to our city – sweet home Chicago. 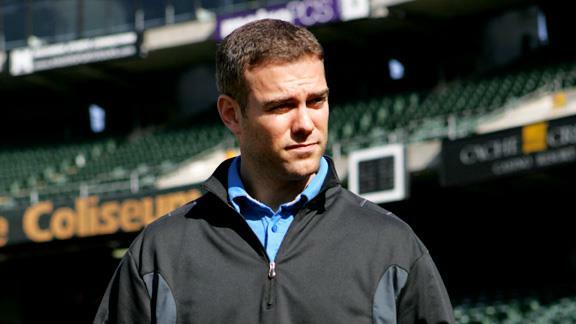 Cubbie fans prepare to officially welcome Theo Epstein at a scheduled Wrigley news conference Tuesday – reports ESPN Chicago. The city has been buzzing since rumors of Epstein joining the Cubs began a few months ago. Some are saying it was the worst-kept secret in baseball, but nonetheless, Epstein officially resigned from his position as the Boston Red Sox general manger this past Friday “effective immediately” and is moving on to an even bigger challenge “The Loveable Losers”. Is he too good to be true? Married or not, he is one attractive Yale-educated World Series mastermind. Coming to Chicago puts quite a bit of weight on Epstein’s shoulders, as Northsiders are ever hopeful for a similar situation as in Boston. Epstein broke the Curse of the Bambino in 2004 after the Red Sox went 86 years without a World Series title. The Red Sox went on to win two World Series pennants (the second in 2007) under the wing of Epstein. Chicago proposes more of a challenge as the Cubs have not won the World Series in 103 years – Curse of the Billy Goat going strong since 1908. Finalization of Epstein’s compensation with Boston has not completely been resolved, but the leading commissioner Bud Selig placed a deadline of November 1st on the situation during Game 4 of the World Series stating “Hopefully they can get things done. I always encourage clubs to try to get things done between themselves. Somehow, the commissioner has enough things of controversy (to deal with)” reports CSNNE.com. If they don’t get things done, Bud will. Epstein has quite a bit of work to do upon his arrival in Chicago. There is still an impending question mark as to who the Cubs will hire as a general manager? Are we keeping Mike Quade, or looking elsewhere? West coast elsewhere…to San Diego’s Jed Hoyer? At least we know Epstein is a genuine man, taking out a full-page ad in last Sunday’s Boston Globe thanking the Red Sox and the city of Boston for their time together. I don’t want to go and say something as drastic as Cubs fans being deprived of a title are desperate for a World Series, but I think it’s safe to say fans are “dreaming” of a World Series. Hopefully Epstein can make some smart front office decisions, the Cubs can see a winning season and possibly a postseason run. First stop for Epstein in his new city of Chicago…Girl and the Goat? He can learn some excellent recipes for cooking goat! Root Root Root for the ??? Whether a North-sider or South-sider, this MLB post season just isn’t very Chicago friendly. We will tune in to support our love for the game, but I mean honestly, who are we expected to cheer for in this World Series match up!? Cardinal fans who have migrated north to a better city are coming out of the woodwork -sporting their red and white tees, congregating at the few local bars supporting St. Louis and overwhelming my mini feed with Cardinal statuses. I have to hold back my urge to comment “Go back to St. Louis if it’s so great!” Despite my instinct, I have matured and do not yell or post such things. I believe if you are a Chicagoan, despite North-side or South-side status, you cannot bring yourself to root for the Cardinals. Albert Pujols is an offensive weapon, batting .419 with 10 RBIs in 11 postseason games, and now has David Freese stepping up his postseason game (12-22 in the Brewers series – not too shabby). The Cards put an offensive spanking on the Milwaukee Brewers during the National League Championship, beating them 12-3 or 7-1 or 12-6 leaving no hope for recovery. (I mean I wouldn’t want the Brewers in the World Series either. With the way the Packers have been playing and Wisconsin’s offensive line eating up the Big Ten, Wisconsin is dominating football – they can’t have baseball bragging rights too!) I can respect the talent on the St. Louis team, but they are the Chicago Cubs biggest rival. I cannot hope they win another World Series before the Cubs even make the playoffs. Take it over to the American League, do we cheer for the Rangers? They’re not in the Central Division. They set a club record with 96 wins this season, only four of those against the White Sox. Josh Hamilton‘s success story is one of the best in the league. They didn’t put as big of a hurt on the White Sox record as the Tigers who defeated Chicago 13 times during the regular season. And they’ve never won a World Series pennant. They also beat out the Detroit Tigers in the American League Championship, that alone makes gives them a few points in my book. (I couldn’t bring myself to cheer for Detroit anything, no Lions, no Tigers, no Pistons, no Redwings). So if I have to choose, I would say Rangers all the way. Predictions say it’s going to be a high scoring World Series, which at least makes for exciting baseball. There is potential for things to get interesting as the only Rangers pitcher to face Pujols in his career is reliever Mike Adams, everyone else will be facing the slugger for the first time. Regardless, both teams have strong bull pens, which will make for a close series. I am ready for the Rangers to take on the Cardinals at Busch Stadium for game one of the 2011 pennant tomorrow night.